Mother of Wisdom, Learning & Music. 'Inventor of all the arts and sciences, patron of all intellectual endeavors, Sarasvati is the very prototype of the female artist. She invented writing so that the songs she inspired could be recorded; she created music so the elegance of her being could be praised. Lotus, Veena or vina an indian stringed instrument, book, peacock, white swan (or goose) the colors white & yellow. A beautiful woman wearing either yellow or white with white skin. She has a gentle expression and four hands which represent the four aspects of human personality in learning: mind, intellect, alertness and ego in which she holds a veena, a book, a lotus & prayer beads. Sometimes she is shown holding a drum or a pen or making a sign of blessing with one of her hands. She sits on ether a peacock or a white swan or goose. Vasant Panchami or Saraswati Day, celebrated every year on the 5th day of the bright fortnight of the lunar month of Magha. It is believed to be her birthday. others that she flowed out of him as the first river. Shortly after she came into being she danced shyly around Brahma so that Brahma brought about the first lust. so that he would not have to turn his head to see her, and when she floated over him he grew a fifth face on the top of his head. Each of the four faces began to speak poetry directed at the Goddess. Because of this she invented writing so that these words could be preserved, and thus was Sanskrit born so that she could write down the four Vedas. After this they retired into seclusion for 147,688,000 years (100 divine years) during which they created everything that exists. and among the Buddhists she is a human, a bodhisattva, but still a human. May she bring me fortune. May she bring me luck. May she bring me protection as she answers my prayers. I sing a magnificent song, for she is a magnificent Goddess. 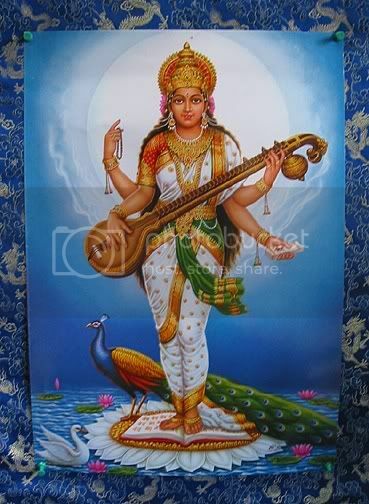 It is Sarasvati whom I praise with hymns and songs. Fullness, beauty, richness, bounty: that is the Goddess. Fullness, beauty, richness, bounty: may she give to us. May Sarasvati send us good luck, for she has luck to spare. May she be our protector, for she has much to give. May we enjoy Sarasvati's breast, which swell and swell. May we gain food from her, and healthy children. white as the moon in autumn. holding in your hands a jar of nectar. on milk and melted butter and the purest water. Hail to Saravati, she who gives us treasure. she of the greatest wealth, we hail her. Through out India there are many temples dedicated to Sarasvati. Students will visit these temples to ask for her help with their studies. Also most libraries to this day will have altar dedicated to her. Try Anoint you tools or book with lotus oil. Falling lightly on others' ears, even as these petals to the water. Let the water carry your wish away. -Use a white altar cloth. -Use four yellow candles to represent the four aspects of human personality in learning: mind, intellect, alertness and ego. -Place a white lotus on your altar (can't find a real one try making one out of paper or tissue). -Store your books, tools, or prayer beads on this altar. Whenever you use these items light the candles and thank Sarasvati. Monaghan, Patricia. The Book of Goddesses & Heroines. New York: Dutton, 1981. Monaghan, Patricia. The Goddess Companion. St. Paul: Llewellyn, 2000. Telesco, Patricia. 365 Goddess. New York: Harper-Collins,1998.